dZi screen printed prayer flags are made by the Tibetan Nuns Projection (TNP), also based in Dharamsala, India. TNP's mission is to provide a safe and supportive environment and education for Tibetan nuns who have fled Tibet for reasons of religious and political persecution. Visit tnp.org to learn more. dZi Paper Prayer flags and incense are made by Tibetan Handicraft in Kathmandu Nepal, a member of Fair Trade Group Nepal and leader among the handmade paper export community. 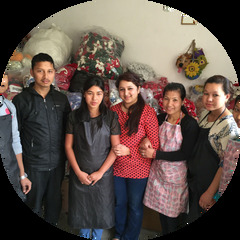 This business Tibet Collection supports hundreds of people in the local community through it's income generation enterprise, and runs an elementary school providing free and low cost education for local children.